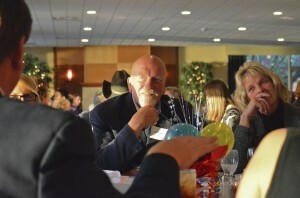 Dr. Ed Haring, former KCC president, listens during the KCC Foundation’s annual Scholarship Dinner held this past fall. The deadline for students to apply for a Kellogg Community College Foundation Scholarship or transfer scholarship for the 2013-14 academic year at Kellogg Community College is 5 p.m. Friday, March 1, 2013. There are more than 100 KCC Foundation Scholarships offered each year, each funded by different donors and with different qualification criteria for recipients. Award amounts vary by scholarship, with recipients determined by selection committees that consider students for all scholarships for which they are eligible. Transfer scholarships – including the Walter and Lucille Harper Scholarship, the Virginia M. Hensley Education or Health Care Two-Year Scholarship, and the Robert F. Hites Family Scholarship – are awarded to students exhibiting outstanding academic and personal achievement who are graduating from KCC and transferring to a baccalaureate-degree granting institution. Transfer scholarship applicants must graduate during the 2012-13 academic year and provide an acceptance letter from the institution to which they will transfer to qualify for the scholarship. A selection committee will review each applicant’s academic records along with their school, community and service activities, and if they are awarded the scholarship the award will be sent directly to the student’s transfer institution. March 1 also is the deadline for students to apply for KCC’s new Aspiring Journalist Fund and the Stetler Scholarship for Non-Traditional Students. Application forms for all KCC Foundation and transfer scholarships can be found online at www.kellogg.edu/foundation. KCC Foundation Scholarship application booklets for 2013-14 are available at area high school counseling departments in addition to the KCC Foundation office and other locations on campus at 450 North Ave., Battle Creek. For more information or to contribute to scholarships, please contact Ginger Cutsinger, KCC Foundation executive director, at 269-965-4161.